My weekend morning started off with a call from Matt Crooke of Fifteen52. I've learned to trust his suggestions, so when he followed up the phone call with an unfamiliar Los Angeles address, I simply packed up my camera and hit the 405 North. The GPS led me up the busy freeway and over the hills of LA before exiting off onto an industrial street. The weekend left the street barren aside from a few recognizable cars, so I continued into the garage where everyone had gathered. I stood inside Workshop5001, a newly founded automotive hub located in one of the old mid-century factories that line LA's streets, begging to be revitalized. The Workshop5001 team has been hard at work, turning the old forgotten building into a a beautiful, stylized hub for automotive repair, restoration, and special projects. 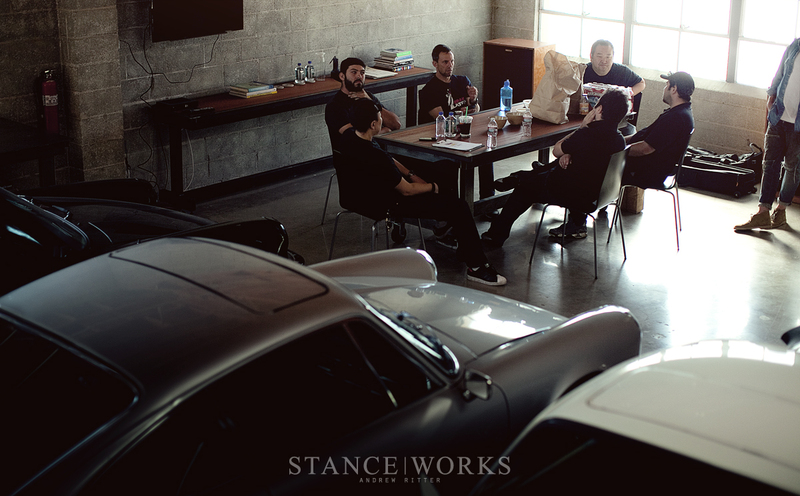 On this day, the workshop had gathered a collection of different Porsches from various segments in our industry for KW Suspension's latest poster photoshoot. I arrived as cars were being positioned to best use the soft light that drifted in through the hazy factory windows. John Pangilinan is often behind many of the cool automotive projects and events that pop up around Southern California, but on this occasion he position himself behind the camera lens, directing the scene from atop his ladder. 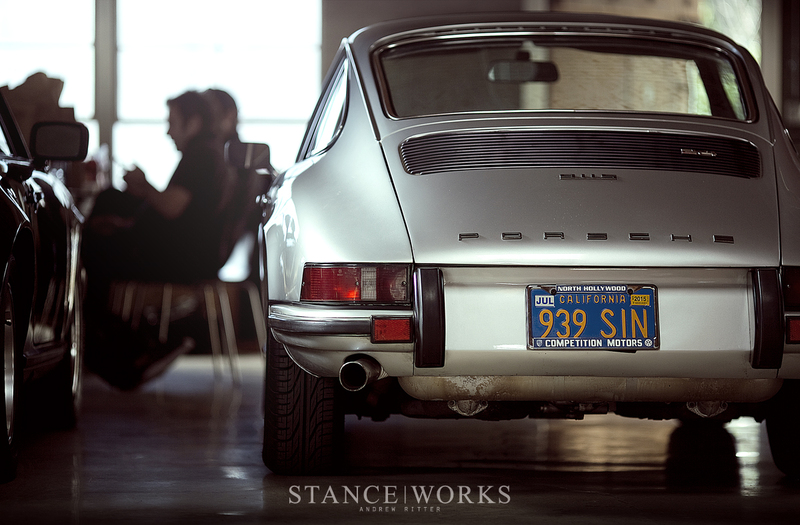 With various 911s in attendance, ranging from the early aircooleds to the latest technology, KW had found a selection of cars that covered Porsche's history and included cars from the different scenes within our industry. 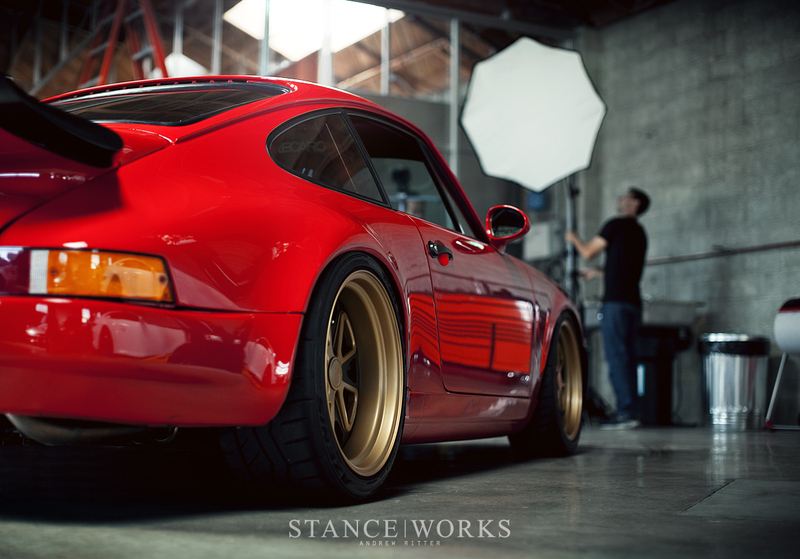 Brian Scotto fired up his Hoonigan RWB 911, its low, menacing appearance representing the aggressive styling of the import scene while BBI Autosport's Project Nasty 911 introduced a slightly more refined and sporty presence to the group. As the photography team positioned their lights and discussed the best angles, the owners gathered around the table. With Porsche enthusiasts from different corners of the automotive world, the discussion danced from fun shenanigans and doing burnouts in new shop spaces to the technical tales of Pikes Peak hillclimbs. In many ways, this is where the true magic lies in the automotive hobby that we all share. The fact that our simple love for cars can give rise to a hearty discussion in a small garage on a random weekend morning is something worth cherishing. As laughs echoed through the showroom and banter continued, the photography teamed turned their lenses towards Lisa Lee Marie, the model that would be gracing the posters. Doing what she does best, Lisa leaned against the fender of BBI's red Carrera and struck the pose that would land on the final poster. For those who would like to pick up a copy of the final print, KW Suspension will be handing them out at their booth at this weekends Formula Drift event in Long Beach. For now, Mike and I will be getting our camera gear ready for this weekend's festivities and we look forward to seeing you out there. I think these are some of your best photos yet Andrew.